Ms. Seema has excellent communication skills. She has done her Master’s in Business Administration with the specialization in Finance & Marketing. She has a diverse experience of around 6 years. 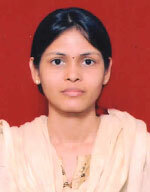 Her work Experience Include DCB Bank Ltd. (Ahmedabad), Kevin Polymers (Ahmedabad) and Cuemath. The subjects handled by her so far Include Accounts, Economics, Marketing Management, Customer Relationship Management. Financial Management.